Electromobility, as well as many other clean, decentralized, power-based technologies are experiencing tremendous growth in Europe. The installation of all these technologies requires an extensive network of skilled and easily accessible electrical contractors. Our member Fédération du Génie Technique (FGT) has just launched an initiative to connect consumers interested in electromobility with local electricians in Luxembourg. We sat down with Pedro Pereira, FGT’s director, who told us all about this exiting project. Q: What is diego in a nutshell? A: It is a platform (www.mydiego.lu) that aims to facilitate the development of smart and innovative technologies as well as to promote the energy transition within Luxemburg. The platform connects consumers looking to install smart or green devices into their homes with the right contractor in their area. diego offers access to a network of contractors all trained to handle the newest technologies and who have agreed to a strict quality charter. Indeed, all diego installations come with a 24-month warranty and our contractors have a technical support service available in case of malfunctions. Q: How did the project come to life? Is there a strong demand for this type of product? A: diego is the brainchild of the Fédération des Artisans, our umbrella association, and Enovos Services, who offer technical services in the energy sector. They decided to combine their expertise in energy services to offer a practical solution to the advancement of the energy transition and meet market demand for innovative and green technologies. With the current trends towards electrification and the rise of smart technologies in home automation, the demand for these products will increase accordingly. It is thus important for us to provide our members with the opportunity to be ready to meet this demand and to be future-proof. Additionally, we find that the package solutions we offer are the best for consumers who might otherwise be overwhelmed with these new technologies and it allows them to take part in the energy transition without any inconvenience. Q: What kind of services and installations do you offer? A: The diego platform is currently available for e-mobility solutions and will soon expand to cover smart devices, renewable energy solutions as well as heating technologies. We propose all-inclusive turnkey solutions that fit the clients’ needs, such as packages that include a charging device for electrical vehicles as well as the installation for e-mobility solutions. Q: How does this process unfold? What are the steps? A: The clients can choose the solution that best fits their needs on the website. Then, all they have to do is provide their contact information and pick out their preferred contractor from our list and wait for the latter to get in touch. All of our partners are committed to be as responsive as possible and we can guarantee a first response within two business days followed by an on-site visit and an offer within seven days, and finally the installation within 10 business days once the offer is signed. It is the most seamless and easiest way for consumers to take part in the energy transition. Q: Who are the contractors listed on the platform? Is there a selection process? A: We are committed to quality and thus our contractors need to conform to this philosophy. They are all members of our association, meaning that we know who they are and how qualitative their work is. 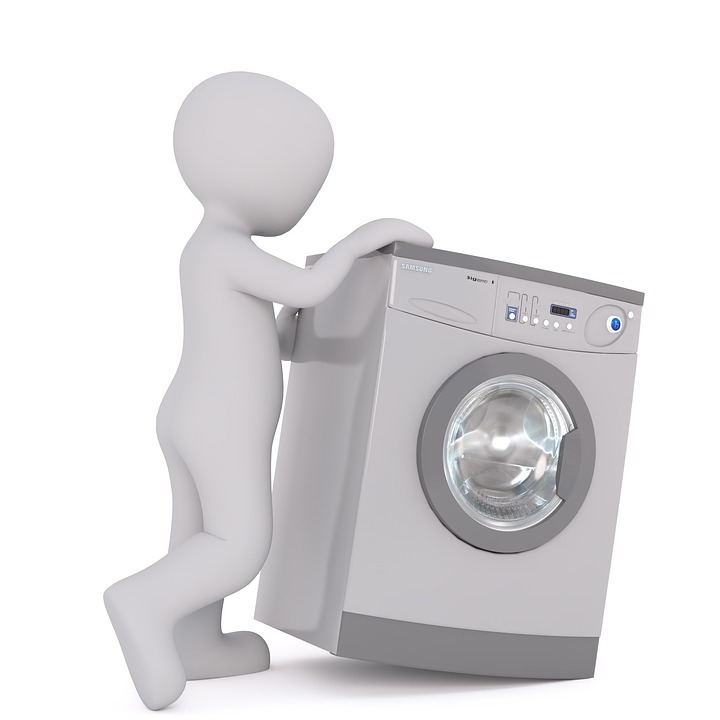 Moreover, we know they are frequently trained by manufacturers to keep up with the newest technologies and practices. Q: Would you call it advantageous for local contractors to be on the platform? A: Indeed, it is. On the diego platform, they have the opportunity to widen their potential customer base and visibility, as well as the breath of products and services they offer. Furthermore, they’ll be able to take advantage of better purchasing conditions thanks to economies of scale and benefit from diego’s expertise in marketing, management and sales processes. With our network, they can keep up with the latest trends in the energy sector and follow our frequent specific training programs. Finally, they can count on our sales methods and values based on transparence, responsibility, professionalism, competitiveness, rigor and solidarity. Q: Do you think you’re ahead of the curve? Should this be a template for the future and for the rest of Europe? A: We are still in the early stages of our marketing process, so we expect to have much more success than we have already had. We are convinced that customers will turn more and more to platforms like diego for this type of all-in-one solution, it certainly is a template for the future. The feedback we’ve had so far is quite positive, from the contractors and from the customers. Even without marketing actions, we had lot of contacts with interested customers. This type of initiative can be replicated at the European level and with the growing demand for low-carbon solutions, it undoubtedly will be. With the growth of new power-based technologies and digital solutions, the electrical contracting sector is expanding and is playing an increasingly important role in the transition to a low-carbon European economy. A growing number of electricians in Europe is designing, installing, maintaining and replacing electrical, lighting and IT systems and is involved in power plant, infrastructure and building projects. Electrical contractors are the people on the ground enabling the switch to renewable energy, energy efficiency, electromobility and other clean, decentralized solutions. But what are the tools policy makers need to provide to electrical contractors, in order to help them build a strong and green future for Europe? If you have missed the release of this document, you can access the policy asks here. 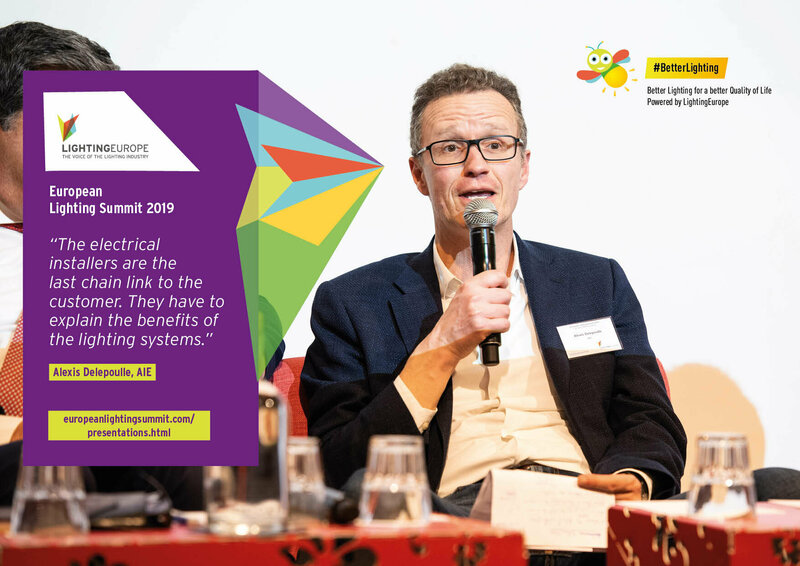 On 21 March, AIE board member Alexis Delepoulle was invited to speak at the annual conference of LightingEurope, the EU association representing the lighting industry. Alexis contributed to a panel discussion gathering representatives of the lighting value chain, from manufacturers to distributors, design companies, and installers. Alexis highlighted the critical nature of the role of installers along the value chain, as they know both what end users need and what the lighting industry can offer to them. Alexis sees installers as integrators of lighting products, who, through improved training, are becoming capable of designing and delivering fully functional solutions, including lighting control systems. They also play an increasingly important role in optimizing lighting systems during their operation, following the results of accurate energy consumption measurements. Going forward, in order to tap into the potential of increasingly efficient and smarter lighting solutions, Alexis and the other panellists concurred that there is a need on the one hand to involve electrical contractors at all stages, and on the other hand to consider end users at the earliest stages. This will lead to a high level of comfort, longer life cycles and lowest need for replacement, as well as higher returns on investment. Electrical contractors need fast standards to deliver cutting-edge products to European consumers! The European Commission has decided to evaluate the Low Voltage Directive (LVD) and has launched a public consultation to which AIE has replied. The Directive applies to electrical equipment sold in Europe with a rated voltage between 50 V and 1,000 V (alternating current) or between 75 V and 1,500 V (direct current). This encompasses a wide variety of devices such as lamps, TVs, toasters, etc. The Directive aims to ensure that these products are safe and can move freely within the internal market. Electrical contractors are the main professional users of electrical equipment within the scope of this Directive, and they play a key role in the implementation of the Directive as they make sure that pieces of equipment are integrated into installations in a safe manner, and advise consumers in order to prevent them from purchasing or using non-compliant or counterfeit products. They are on the frontline of electrical safety and can offer direct insight of how the measure impacts the consumers. While we believe that the LVD is fit for purpose and does not require any particular adjustments, we are concerned with the growing mismatch between fast-evolving products on the market and slow-paced standardization for these products. Electrical contractors are ramping up their efforts to gather the necessary competences, skills and qualifications that are needed to deliver safe installations using LVD-compliant, new and emerging solutions. Electrical contractors do however experience some difficulties when they want to offer cutting-edge devices to European consumers but are unable to do so due to the unavailability of harmonized standards for these products. AIE therefore suggests that the Commission and relevant authorities evaluate options to speed up harmonized standard procedures, making sure that they keep pace with fast-evolving power-based solutions on the European market. Electrical contractors are delivering to European consumers an increasing number of green, digital technologies, including smart metering and home automation solutions. 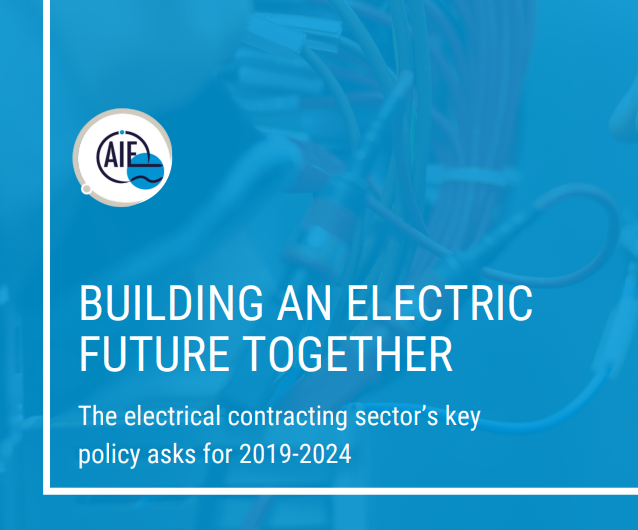 Through our involvement over the last 3 years in an EU co-funded project called “SMARTEL”, we at AIE have contributed to providing electricians with the necessary knowledge to offer these solutions. The project has now come to an end and has delivered, among others, a so-called "MOOC", a Massive Open On-Line Course, which electricians from across Europe can follow for free, at their preferred time, pace and location. Not only is the SMARTEL training material relevant, flexible and accessible in today's fast-paced electrical and digital sectors, but it also contributes to the electricians' employability and mobility, as it is anchored in the EU qualification and credit systems. In the final project policy recommendations, developed with the other five partners, we encourage relevant decision makers at national level to build on this project and modernize as well as enhance vocational education and training opportunities for our sector, enabling electrical contractors to power Europe's green and digital society and economy. Fore more information about SMARTEL, have a look at the project website and do not hesitate to get in touch!